Association Light/Welterweight champion, Vivian Harris, is out to prove them wrong when he steps into the ring tomorrow night against Mexican Ramon Alvarez for the IBF/NABF Light/Middleweight title in Guanajuato, Mexico. This is Harris’ 33rd professional bout after he was successful in his last against Jorge Paez (Jnr.) in March this year. 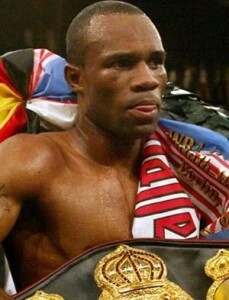 Word out of Harris’ camp is that the former world champion is in tip top shape and rearing to go. He will not have it easy against an opponent that has amassed 20 wins as against 4 losses ever since his professional career began in January 2008. Alvarez had lost his first fight to Augustin Marquez but has managed to compile a decent record that sports a knockout percentage ratio of 46.15. He was victorious in his last 6 bouts, his last being a unanimous verdict against Omar Chavez in September. Harris became Guyana’s fourth world champion after knocking out Diosbelys Hurtado in the second round in September 2002 for the World Boxing Association (WBA) and the International Boxing Association (IBA) Light/Welterweight titles. He defended that title three times before his shock defeat to little known, Columbian, Carlos Maussa. Harris rebounded with three wins against Marteze Logan, Steve Johnson and Juan Lazcano, all on points before slipping once again with a loss to Junior Witter for the WBC Light/Welterweight title in Yorkshire England. His next nine fights were unflattering with 1 win, 1 no contest, 1 draw and 6 losses. He was to have fought for the WBA Inter-Continental title but after travelling all the way to the United Kingdom, those authorities cancelled the bout after he had failed medical tests. True to his word, Harris had rebounded with victories over Shakha Moore and Danny O’Connor with his last bout against Jorge Paez (Jnr.) occurring in March this year. He has fought 32 times, lost nine while stopping 19 of his opponents with a knockout ratio of 43.18. Alvarez is currently the World Boxing Organization North American Boxing Organization (WBONABO) champion. He has 20 wins (12 by KO) with 4 losses. He drew 2 of his bouts and has a knockout ratio of 46.15. He last fought in September and registered a win against Mexican, Omar Chavez.